Given a lot of the company's actions in the past few years, it's fair to ask: have the minds behind Doritos completely and utterly lost it? Has anyone yet done the necessary research to trace the roots of Doritos' descent into the dark heart of absurdity into some sort of workable timeline? What I discovered when I looked into this is that Doritos' steady descent has been going on for a long time, but in the last few years, it has started accelerating rapidly. Join me, then, for a look into Doritos' journey towards out-and-out madness. Because this is Jezebel, we're going to compare each level of Doritos' lunacy to a particular incident of a celebrity wandering off the sanity ranch. Before anyone asks, no, we're not counting the numerous Japanese flavors of Doritos, because it's Japan, and they come up with unique, potentially delicious/potentially terrifying flavors for every snack treat. * That's just what they do, and bless them for it. No, for the purposes of this post, we're looking for ideas that stretch the boundaries of basic logic and ethics far more than simply making a shrimp mayonnaise-flavored corn chip (which, incidentally, sounds delicious). That Time They Decided to Rename "Cool Ranch" as "Cooler Ranch"
Date of Incident: The early 2000's? I think? Does anyone actually have an answer to this? Explanation: In Doritos' defense, the early aughts were a terrible time for all of us. I tried to figure out when specifically this had happened, and I came to the perhaps not all that surprising conclusion that Doritos appears to have attempted to expunge all evidence of the Cooler Ranchening from the internet. The only place I could even find a mention of it happening was on Doritos' Wikipedia page — they appear to have disavowed all knowledge of the time they committed an unspeakable crime against grammar in the name of edgy marketing. You can find images online, like the one I'm using here, but they're invariably grainy and outdated. They're basically the Zapruder Footage of corn chips. Celebrity Craziness Level: Taylor Swift crossing her eyes on an Instagram selfie that obviously took six tries. Come on, Taylor, you're not fooling anyone. In short, not crazy at all, just kind of eye-rolly. Explanation: Doritos Collisions are a lot less crazy than most of the following entries, but they were a pretty good future indicator of Doritos' willingness to fly close to the sun. They're exactly what it says on the package: two flavors, one bag. Unlike most of the entries on this list, they're still around. Consider these Doritos' tentative steps into the crazy pool; they weren't yet ready to go full-Courtney Love, so they were just dabbling. Celebrity Craziness Level: That time Amanda Bynes really wanted to create a Doritos Collision between her and Drake's pants-parts. Silly Amanda, Sailor Moon is the only woman for Drake. ** Still, can you really blame Amanda for that one? Explanation: The story of Doritos Locos Tacos is one of heartbreak, intrigue, and betrayal — unless you're adhering to the more boring "reality" version, which is that it's the story of one guy who was REALLY into the idea of eating as many greasy, chemical-tasting things as he possibly could at the same time. I still don't understand why, but Locos Tacos were the most successful product launch in Taco Bell's history, and one of the most successful fast food items ever. Then again, I also think McGriddles are really freaking gross, so what the hell do I know? Celebrity Craziness Level: Tom Cruise on Oprah. Crazy as hell, but people were way more entertained than appalled, and if anything, it's helped their careers. Explanation: Here's where it starts really going off the rails. Doritos Locos Tacos were crazy, but they were crazy like an unbelievably stoned fox. If you haven't seen Doritos Jacked (I hadn't until I wrote this), though, the company essentially circumvented the product testing stage by actually getting people to pay to be their guinea pigs. The accompanying image here is not some sort of artist's commentary on the state of modern society — these were actually packaged in shiny silver bags with things like "Test Flavor: 2653" on them, like dehydrated c-rations from a dystopian moon base. According to Doritos, Test Flavor 2653 turned out to be Chocolate Chipotle Bacon, but I'm not 100% certain it wasn't actually "Stuff Found Under the Sink." Celebrity Craziness Level: Shia LaBeouf attending a performance of Cabaret. Just inexplicable on so many levels. Explanation:So they're cheese sticks, only they're in triangle shape and instead of edible dairy products and they're filled with melted nacho cheese plastic. I'm pretty sure I'm not the target market for this considering that I think exploding nacho cheese clusters covered in radioactive nacho dust sound less like a delicious snack treat than what would happen if you set a Tasmanian devil loose in a movie theater concession stand. I've covered these before, but this seems like the nadir to me. I feel like we're going to look back at Doritos Loaded in 20 years and view it as the beginning of the end. Celebrity Craziness Level: Bald Britney. Shocking at the time, but in retrospect just more sad and desperate than anything. Date of Release: As-yet unreleased in the US, though they're available in Canada. I guess they figured with the Stanley Cup over, Canadians would be bored enough to try anything. Explanation: Here's where we reach Roman Emperor/Mad Scientist levels of loony — these things are essentially regular bags of chips with a few unbelievably spicy chips randomly thrown into the bag. When I first saw this, I honestly assumed they weren't even labeling these bags and were instead just randomly strewing them across every country on the globe. That's where we are with Doritos, now — it honestly would not surprise me to see them do this to their regular chip bags just to see if they could get away with it (and I guarantee you they could). Celebrity Craziness Level: Charlie Sheen. They're acting really goddamned crazy, but it looks like they're having a hell of a lot of fun doing it. Ultimately, I can't fault Doritos for any of this; their strategy of "let's just make our chips more and more unfathomably bizarre" seems to be working like gangbusters for them. I also in no way want them to stop, since they consistently give me GREAT material. But I can't help but wonder where they're going to go from here. 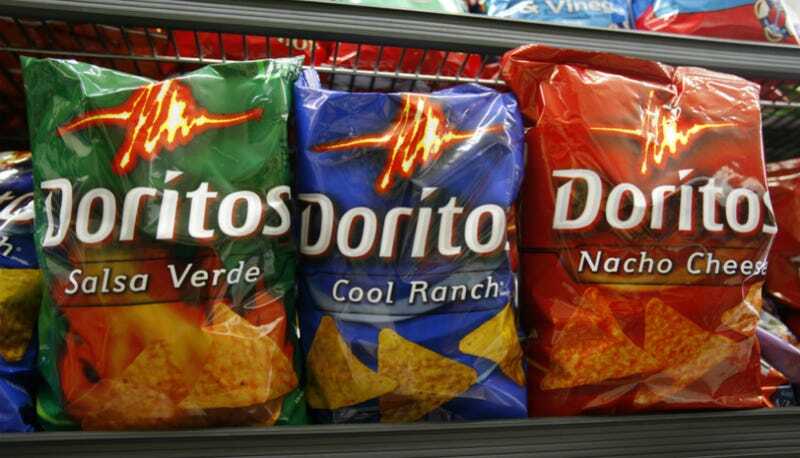 What's next for Doritos? Are they going to fill each chip bag with an ornery wolverine and call it Doritos Clawd? Are they going to fill a bag with nacho cheese-flavored shards of glass and call it Doritos Edge? Singing chips they'll call Do-re-mi-tos? *** I think they've proven that nothing is beyond their capacity, include the silly limits of things like "sanity" and "ethics." Whatever it is, I'm sure Americans will go nuts for it for reasons entirely beyond my understanding, if not my appreciation. * Side note: if anyone has access to any of those Kit-Kat flavors, please, please let me know. I want to try them so badly it's not even funny. ** Thanks to Isha for letting me use this image (and for the Doritos Edge joke). Seriously, you guys have no idea, she's got like a hundred of those things. Lead image via AP. Special thanks to Isha, Erin, and Rebecca for their help with this post.